Safe Storage Solutions provides a clean and professionally managed facility geared specifically to the needs of the Recreational Boater. 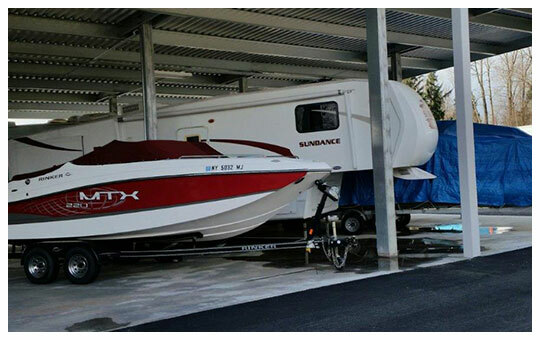 We understand the challenges associated with the storage of your boat & personal watercraft trailers and our Ferndale Facility is designed to provide a safe, secure and convenient solution to your boat & personal watercraft Storage needs. Our site is designed to provide easy access to your Boat or Personal Watercraft. 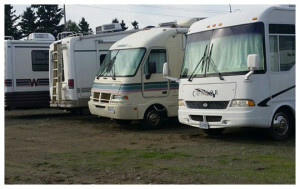 Many of our spaces are pull through spaces that eliminate the difficulty of backing your trailer into a tight space. You will find extra wide driveways, and large turning radiuses throughout the facility. In addition, there are wide turn outs and alleys for easy maneuvering in and out of our Boat/Personal Watercraft storage spaces. The site is being renovated and now includes state of the art security cameras and upgraded lighting. This lighting combined with I-5 visibility, 8′ barbed wire fencing and security cameras will ensure that your vehicle is safe, secure and under constant surveillance. In addition, access to the facility is controlled by individual security codes and we have an onsite manager 24-7. Our site is conveniently located on the I-5 just 10 miles south of the Canadian Border and just 8 miles north of Bellingham off of exit 266. No back roads to navigate or side roads to slow you down just exit, park it and go. Whether you’re headed out to the lake for a weekend or planning to launch your boat in Birch Bay, Safe Storage Solutions is conveniently located to be the gateway to your destination! We are just 2 miles from Birch Bay and a short drive to Bellingham Harbor, Blaine Harbor, Semiahmoo Marina and Crescent Beach, B.C. Why deal with the congestion and high prices of the city? You’ll be on the water faster and spend a little more time on vacation and a little less time stuck in traffic.